Confident that super-rich collectors and wealthy art institutions will continue their hunt for the very rarest works of art, both Christie's and Sotheby's are looking to improve on already spectacular gains in recent years. 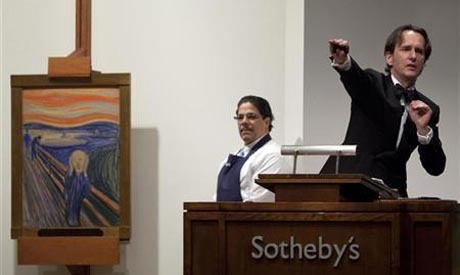 Shrugging off fears of slow economic growth and the impact of countries paying down mountains of debt, Sotheby's announced yesterday, Monday 14 January, it expected to sell art worth 103-149 million pounds ($166-239 million) at an auction on 5 February. That tally from the impressionist, modern and surreal evening sale is well up on the 79-113 million expected from the equivalent auction of 2012, although that fell short of estimates in the end to realise 78.9 million. Its top lot on the night is expected to be Pablo Picasso's 1932 portrait "Femme assise pres d'une fenetre", depicting his "golden muse" Marie-Therese Walter and estimated at 25-35 million pounds. Christie's, which holds its equivalent sale on 6 February, has similar expectations - 98-147 million pounds versus year-ago estimates of 86-127 million and an actual total of 135 million. The auction is led by another portrait of an artist's muse, this time "Jeanne Hebuterne (au chapeau)", dated 1919 and painted by Amedeo Modigliani, which the auctioneer expects to fetch 16-22 million pounds. The sales are part of a series of London auctions in February likely to be worth around 500 million pounds in total, providing an early barometer of the strength of the art market going into 2013. Fuelled by collectors from traditional markets like Britain and the United States and new buyers from Russia, China and the Middle East, confidence is high that 2013 will again underline art's resilience in the face of broader economic uncertainty. New galleries and museums opening in the Middle East and elsewhere have further boosted demand for the most coveted paintings and sculptures, although the picture for lesser works is seen as less bullish. A version of Edvard Munch's "The Scream" became the most valuable work of art sold at auction when it went for $120 million last year, reportedly to U.S. financier Leon Black. And Qatar snapped up Paul Cezanne's "The Card Players" for more than $250 million in a private sale in 2011 which has been widely reported but not yet confirmed. "I believe the top end of the art market will continue to perform strongly, particularly in the contemporary, impressionist and modern art sectors," said Georgina Adam, editor-at-large of The Art Newspaper. "As other investments become less attractive - yields on bonds are minimal, and equities are volatile - it will remain tempting to put at least some of a portfolio into something solid," she wrote in a market analysis last week.